One recommended way to invest money is to find stock market picks that are showing relative strength. Why? Shares with relative strength show signs of strong accumulation by institutional investors. These investors need to place huge amounts of money so their buying can move the share price up. And you can use these price movements for profitable trades. This movement then defines relative strength of particular ticker or whole sector that we can use for our profitable stock strategies. 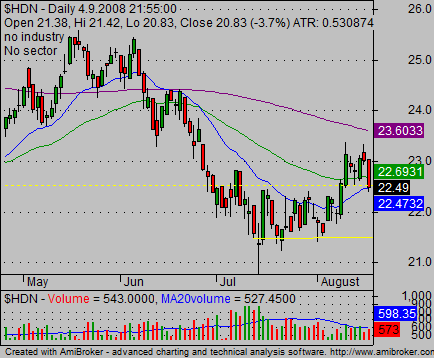 These picks are ideal candidates for a swing trades or for position trades. But active investors can use them also as an investment picks that could be held for months. The best way is to divide U.S. markets and exchanges into two categories. During this first step you must evaluate which part of the market is stronger than another. 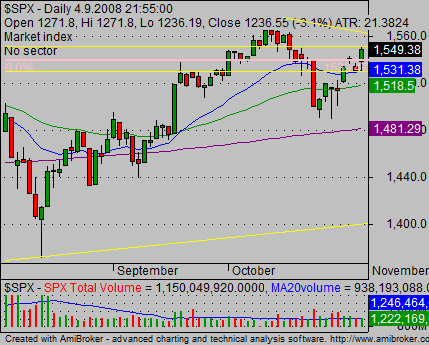 This can be done simply by comparing charts of these main market indexes. The best way is to have both charts on the screen together and compare them visually. Here’s an example of how these charts can be compared. 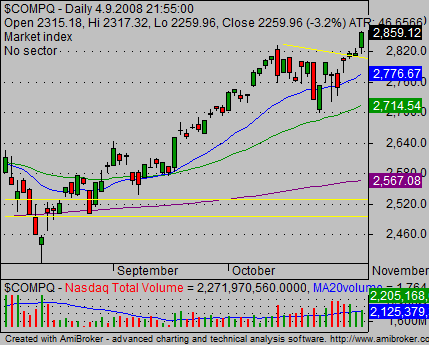 As you can see in October the NASDAQ index was able to move much higher after a slighter pullback. The S&P500 was much weaker, and its pullback was much deeper. So the conclusion is that it was better to look for stock market picks for a long trade in technology-related stocks. It’s necessary to look at sector charts. You can do it using ETF securities that represent individual sectors traded on the market. And here’s an example of comparing of two sectors in the technology area. In the middle of August 2008 it was easy to spot that the biotechnology sector (represented by an ETF with the symbol IBB) is the strongest sector from NASDAQ-related stocks. And that the Internet sector is very weak. 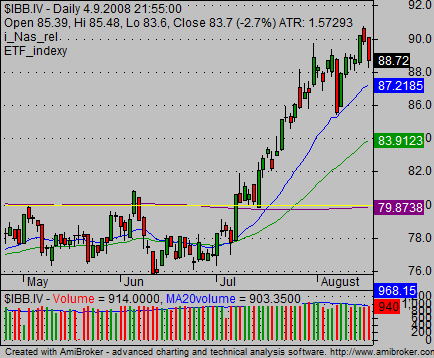 The logical conclusion is that best picks to buy for a long trade during that time period was in biotechnology sector.